Home - Fancy singing in front of MILLIONS on ITV? 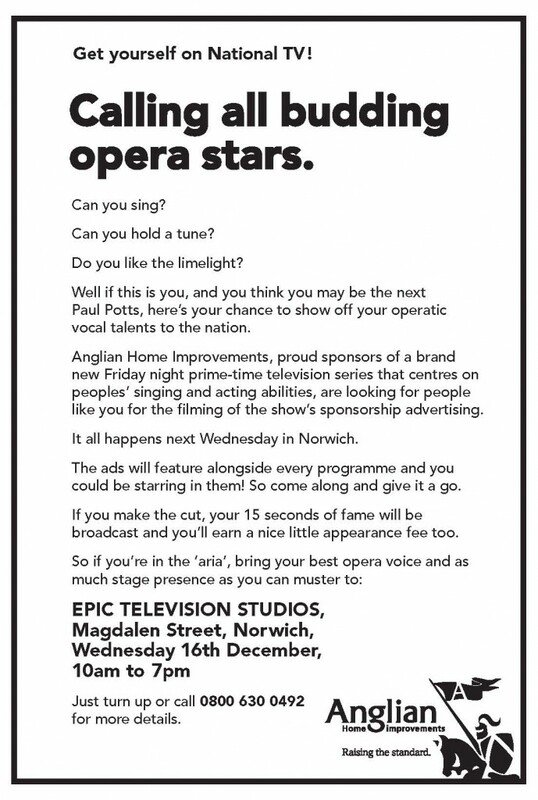 Fancy singing in front of MILLIONS on ITV? The Blog Team have just heard the fantastic news that we will be sponsoring a new Friday night primetime ITV show starting in January next year. The even BIGGER news is that YOU could be performing in front of millions but only if you have the talent to get passed the auditions! So, what are you waiting for? Sign up, step forward and hit the high note infront of the nation in 2010! Anglian Home Improvements, raising the roof in 2010!